The first trailer for the final entry in the Skywalker saga has landed. So, we’re doing what we do best: obsessing over every last detail. You all know the drill by now. Whenever a Star Wars trailer drops, we have to pick through every tiny moment, trying to glean as much information as we can about what could possibly come next for our intrepid heroes. With The Last Jedi rocking the foundations of the franchise, where Rey, Poe, Finn and the surviving Original Trilogy cast could go next has been hotly debated throughout the fandom. There has been theory, after theory, after theory. But now, we at least have some footage to use as a basis for speculating about how J.J. Abrams will close out the series. Just as soon as we stop crying over that brief glimpse at Carrie Fisher’s Leia, of course. Don’t miss what we think The Rise of Skywalker title means, too. 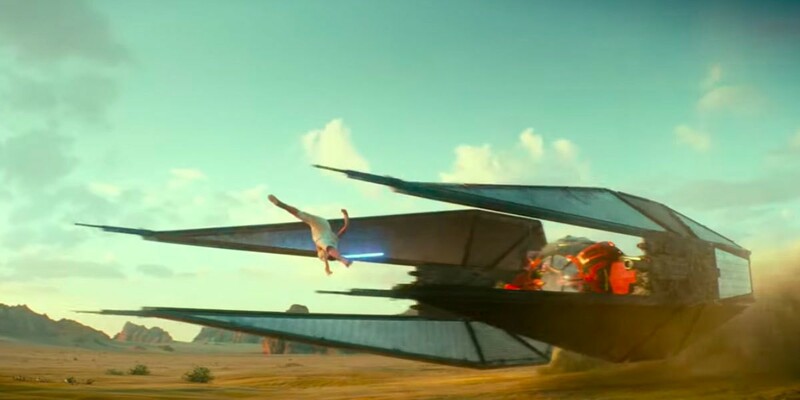 The opening moments of the Rise of Skywalker trailer are nothing short of breathtaking — with the visuals of Rey, using her newly-constructed lightsaber, taking on a First Order TIE Interceptor — but it is Luke’s narration over the top that has our attention. Episode IX, if those words are to be believed, is truly passing the baton on to the new generation of Jedi — specifically, to Rey. But there is one thing that remains somewhat ambiguous, considering that Luke was the only Jedi that Rey trained with in the previous movie: who is the “we” that he is referring to? Fandom has long speculated that Luke’s demise in The Last Jedi did not mean he wouldn’t return in the next installment. With the potential for several Force Ghosts to pop up in the intervening years between movies — from Qui-Gon, to Obi-Wan, to Anakin, to Yoda, to Luke — there’s a whole generation of Jedi that Rey could learn from. Rey was already a formidable adversary for the First Order, but with the potential knowledge of those Jedi at her fingertips? They won’t stand a chance. After eliminating Snoke, and taking his place as Supreme Leader, Kylo Ren positioned himself as the central antagonist as the saga heads into The Rise of Skywalker. We don’t get much of a glimpse at what he is up to, beyond some chilling moves as he takes down an adversary in a red-bathed forest, as well as him repairing his shattered helmet. 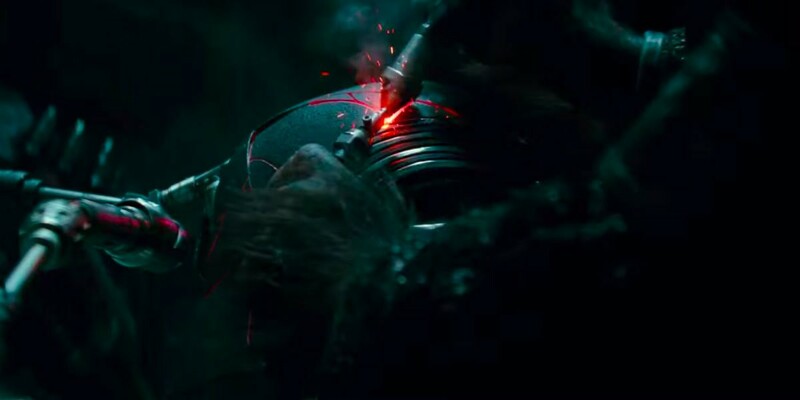 Whether you’re on the side of Kylo’s redemption or not, these initial shots seem to establish that he will at least begin Episode IX in opposition to our heroes. Oh, Lando. How we’ve missed you. A lot has happened since Lando last appeared in a Star Wars movie — not counting, of course, the Han Solo solo outing. But there was something that felt undeniably right about seeing him back in the pilot’s seat of the Millennium Falcon, alongside Chewbacca. 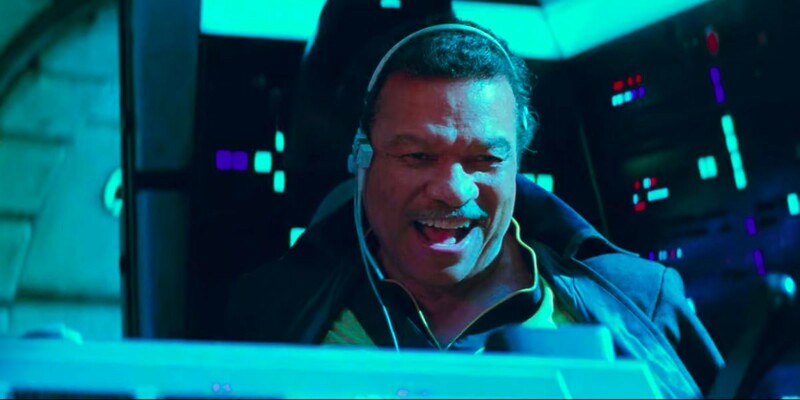 Lando, from the looks of it, feels just as delighted about the prospect as we are. As one of the few remaining ties back to the Original Trilogy, it is great to have that thread solidified in the trailer, though little is known about what role — specifically — Lando will play. Honestly, we’re just stoked that he’ll be involved at all. If we thought that Carrie Fisher’s scenes in The Last Jedi would wreck us emotionally, that was barely a patch on the brief flash we got of Leia’s return in the trailer. We’ve known for some time that J.J. Abrams intended to utilize unused footage from the previous movies to close out Leia’s story, but seeing it in action was nothing short of a gut-punch. 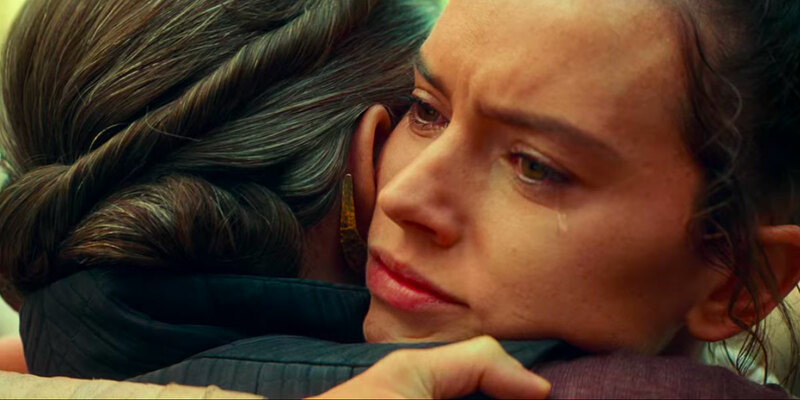 What the moment between Leia and Rey is about is unclear, though whatever it is is enough to move both to tears — could it be grief? A reunion? Or an as-yet-unknown revelation that brings the two closer together? — and, well, us, too. Early concept art for Episode VII had a character — later developed into Rey — exploring the ruins of the Death Star, searching for something held within. The Episode IX panel confirmed that the movie would see the trio of Rey, Finn and Poe on an adventure together, with time having passed since the events of The Last Jedi. 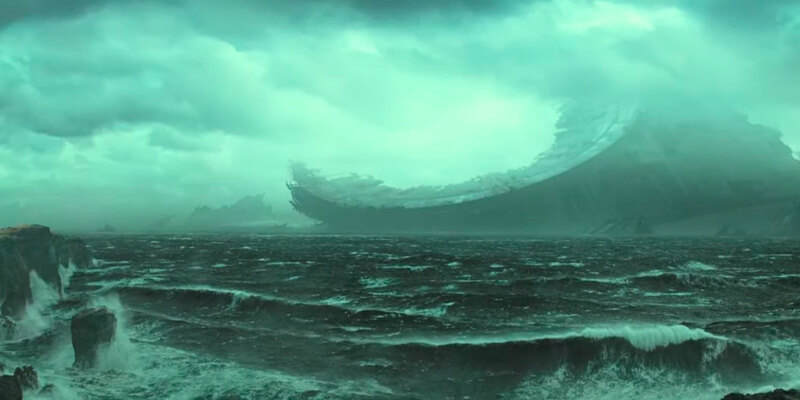 That concept art appears to be coming back to life in The Rise of Skywalker, as the trio — as well as C-3PO, Chewbacca and BB-8 — cross a cliff-top, overlooking the wrecked dish of the Death Star. What they are searching for is still unclear, but it is a visually stunning shot. Actor Ian McDiarmid, who plays the Emperor, came out on stage at Star Wars Celebration after the trailer played for the first time. But he only said one thing: “Roll it again.” He left the stage, and the trailer played again. That’s it. He said nothing else. Palpatine’s fingerprints have been all over the newest trilogy. At least, when it comes to the supplemental material, particularly the novels. In the Aftermath trilogy, specifically, it was revealed that Palpatine had an observatory on Jakku — Rey’s “home” for the vast majority of her life — and was mapping out the Unknown Region. Jakku also housed several Sith relics and artifacts, which were fiercely and closely protected by Galli, a.k.a. Gallius Rax. With some strong ties between Palpatine and Jakku, and the swift demise of Snoke in The Last Jedi, that the Emperor could return once more in Episode IX is a tantalizing concept — and one that pays tribute to the sheer terror of both his reign and original rise to power. Over the course of the Skywalker Saga, one thing has been abundantly clear: Palpatine had power beyond comprehension, especially if his tale about Darth Plagueis was true. “No one’s ever really gone,” Luke’s voice echoes. And, if Palpatine has power over life and death, his return could shake up the entire Star Wars universe once more.